The bidding goes : South 1 , West 2 (majors) but explained weak overcall in diamonds from East, North 2NT, East 3 , South P, West 3 (! ), North Dbl, all pass. Before the opening lead declarer informs about misinformation given. Contract just made! Director! I give you the whole hand in the image attachment. The starting point is to find out what the actual agreement was (they may all play a SAYC base, but presumably there are variations amongst the players in the field as to whether they play a bid to show both majors over an opposing 1 , and if so what it is; and presumably some people play one thing with one or more partners and something else with others). Law 21B1(b) requires the TD to presume Mistaken Explanation rather than Mistaken Call in the absence of evidence to the contrary, but there is usually some evidence, even if not always conclusive. As ever there are two possible bases for adjustment. N/S may have taken some action detrimental to their side on the basis of misinformation (MI). Alternatively E/W may have taken some action influenced by unauthorised information (UI), so we would need to consider logical alternatives and the question of what is suggested by the UI. There may or may not be MI, depending on what the actual agreement was. There is definitely UI whenever a player makes a bid thinking it shows one thing, and his partner's explanation is that it shows something else. That is irrespective of who was right about the partnership agreement. Do we have any clue as to whether there was a partnership agreement, and if so what it was? Well the first thing is, of course, did the director offer South his last call back. The second think would be to find out what North would have done had he been told that the bid actually showed the majors (and whether he guessed the fact, to ascertain if he was trying a 'gambling action;) We will assume that North would have led the same against 3 Spades doubled as 3 Spades - although this may not actually be the case and again there could be an element of gambling involved. West has bid both majors and East has then bid diamonds. Is there a partnership agreement as to what this means? If so then West must apply it, if not then he must try and work out what it could mean, "carefully avoiding" taking advantage of the UI. (The UI being that East is replying to a weak Diamond bid by West) By default the assumption must be that East has a diamond suit and shortage in the majors - however polling other Wests may produce other answers. e.g. shows support for both suits, game forcing and a diamond shortage, or is a long-suit game try e.g. 4-4-4-1 with a club shortage. The next question is: does the UI suggest that diamonds is not the best denomination and a major might be better? Almost certainly - so we then have to ask (by polling): is there a logical alternative to bidding 3 Spades? If not then we allow the 3 Spade bid, if so then if the LA is suggested by the MI then we apply it. We must also ask East why didn't he alert the 3 Spade response? If there is no partnership agreement then it should be alerted. If East is going to treat it as being natural then he should again alert it as it now has a potentially unexpected meaning (given that the West hand has been described as weak with diamonds). Thus, depending on circumstances, we may be either ruling the contract back to 3 Diamonds by East or 3 Spades by West (or higher contracts if East has UI) AND we may be giving a split result if we think North was gambling. There is one more thing, if the actual understanding turns out to be something like "majors2Dunless he rebids diamonds, in which case diamonds" then that may beoe an illegal agreement. "Majors or perhaps diamonds" is the same as "majors or diamonds", it is not permitted as an agreement for an overcall of 1C (unless 1C could be short). The actual agreement does not matter for unauthorised information. West does not appear to have used unauthorised information, I do not see a logical alternative to 3S. East does not have unauthorised information, as far as we have been told. Without putting words in NS mouths, I am sure that if 2D is explained as majors, they would tell me they would bid differently and would not double 3S. EW where keeping a good score even without double. 3 was a worse contract but was never bid during auction. North MIGHT have decided to bid 3NT after 3 P -P (he is vulnerable) and there is no doubt (well that should be polled but is quite likely) that East would lead AK of diamonds- 5 clubs, 2 diamonds and 2 aces = 9 tricks. Something to think about. Note that a bidding misunderstanding/ unauthorised panic does not force you to give the perpetrators a bad score and the other side a good one. The loss to North South might just be the difference between a bottom and a poor score - in which case equity is served by giving them the poor score. West does not appear to have used unauthorised information, I do not see a logical alternative to 3S. Well, it depends on what 3 would have meant had E duly alerted and described 2 as majors. I don't think this is at all clear (as per weejonnie's first post). If W thinks that E is making some sort of game try in the majors, might 4 not perhaps be a non-suggested LA? ..., might 4 not perhaps be a non-suggested LA? Besides, I think that even an offending player is allowed to be woken up by the contents of dummy. N has (hypothetically) bid 2NT then 3NT, yet dummy has Qxxx. Surely a switch is called for, and (even though W has not bid spades in this scenario) I think that E (who we are assuming has no UI) may work out that W has the majors. Without going into it in great detail, I am not inclined to rule on the basis that N/S will always make 3NT if in it. Even if N/S only make 3NT part of the time, the adjusted (weighted) score is probably going to be an improvement on the table result. Deep Finesse indicates that after the AD lead 3NT is unbeatable (Provided North ducks the 1st spade - which is not too hard a play to find given that he knows West has spades). Something seems wrong on both sides in terms of E/W. 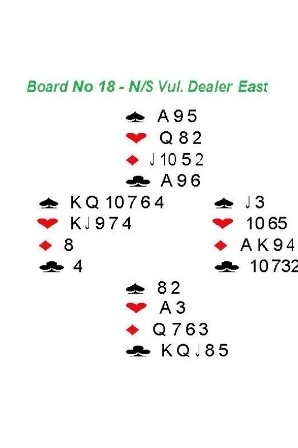 If East didn't alert 3 , it must have been interpreted as a natural game try or choice-of-suits showing something like 6 diamonds and 4 spades. Passing opposite a bid like that makes no sense with the East hand (correcting to diamonds would be the correct response there for East). There's no indication in the write-up that East has UI (unless 3 would have been alertable with the partnership agreement), but East's actions indicate that they must have had unauthorised information from somewhere. Going the other way, if there's a logical alternative to West's bid, then West would have to take it, I think. West has unauthorised information that East thinks West has a weak hand with diamonds (and thus that East's bid is really a pre-empt extension). Correcting to your longest suit at the lowest level is about the most highly suggested bid by the UI of any. For what it's worth, if I'd made a bid that showed the majors and my partner had responded with an undiscussed 3 (when diamonds was previously unbid), I'd be interpreting it as a weak hand with something like seven diamonds, which makes passing a logical option for me. It might or might not be a logical option for these players, though, depending on the system they're using. East had apparently agreed to that 2 shows the majors. When West bids 3 , it is likely that East remembered this agreement, and (in the absence of unauthorised information) he is allowed to wake up. When East has got unauthorised information it is very difficult to tell if they can wake up. Imagine we poll East's peers: what do we ask them "imagine you have forgotten your agreement that 2 shows the majors, what do you bid now?" ? b) find out whether West thought there were any continuations other than 'preference' over his call. 3 was not alerted. So I don't think East has UI, and no gestures about not alerting 2 were mentioned. So probably East is probably allowed to wake up after 3 , and as Weejonnie says, East has no reason to bid over 3 doubled, as he can let west to correct himself. So the matter is, if 3 is 6-7 diamonds and East says 'partner leave me alone with your majors, I only have diamonds', has West pass over 3 a logical alternative? Well I tend to agree with BarkerBridge that 3 has not a logical alternative to 3 , except as Abbeybear notes West could bid 4 , if 3 asks for preference. Also even if we judge that West must pass 3 , North would double 3 , and the West would bid for sure 3 in the next round. But weejonie also points out another logical scenario of North bidding 3NT over 3 , then East leads A, and although East wakes up when seeing dummy, now it's late and with careful play by North he makes 3NT. But East could wake up before the first lead (after West bids 3 ), so with J lead, the contract is doomed.